Turn your GREEN dream into reality with these environmentally-friendly tips! While Christmas is sometimes white with snow, it generally isn’t “green.” All that one-time-use wrapping paper and packaging, fuel spent traveling and shipping presents, and energy used to light up houses and trees means the holiday season takes a toll on the environment. In fact, according the U.S. Environmental Protection Agency, Americans produce about one million extra tons of trash around the holidays! The agency reports that the volume of household waste between Thanksgiving and New Year’s Day rises by 25% above normal. LED lights can last up to 10 times longer, use 80% less energy than traditional incandescent holiday lights and are ENERGY STAR qualified. They are also more durable and shock resistant than other lights because they do not have moving parts, filaments or glass. Find LED lights at your local hardware store, and don’t forget to recycle your old lights! Use a timer for your external lighting decorations—a huge electricity saver! Wrap your gifts in recycled paper, rather than shiny, metallic rolls you see in your local shops which are hard to recycle. Greenfieldpaper.com has fantastic, green wrapping paper options. Send Christmas cards printed on recycled paper, or send homemade cards. Often times, online retailers have better pricing than “bricks and mortar” stores, plus you’ll save fuel, time (and stress!) traveling from store to store. Although plastic Christmas trees are reusable from year to year, real trees are the more sustainable choice. Plastic trees are made of petroleum products (PVC), and use up resources in both the manufacture and shipping. While artificial trees theoretically last forever, research shows that they are typically discarded when repeated use makes them less attractive. Discarded artificial trees are then sent to landfills, where their plastic content makes them last forever. 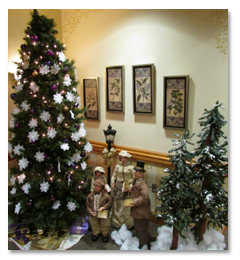 At St. Anne’s Retirement Community, Residents and visitors always admire our seasonal decorations, and Christmas is by far one of the most beautiful times of the year on our campus. To set up a tour (and get a few decorating ideas! ), please call 717-285-5443717-285-5443.